Gonna share a post with you guys that might shock you so much... but it's real. OK SO I THOUGHT THAT WAS THE END OF MY ADVENTURE WITH THIS GUY BUT NO. So me and Lynn went to get our lunch and we took turns cox we need someone to take care of our belongings so when I returned to my seat I saw the guy sitting just behind me wtf got so zhun or not ?!?! So I just smiled at him and start eating my food cox I was mad hungry. THEN SOMEONE TAPPED ME. BIGGEST SHOCK OF MY LIFE K I ALMOST CHOKE ON MY MUSHROOM. So turn out is that guy lah! And he randomly told me my cap is very cute lolol. (On a side note, my cap was really popular in Japan leh! I was walking along Harajuku and this woman suddenly tapped me and asked to take a photo of my cap for some fashion magazine cox she said it was cute) OK BACK TO TOPIC. So we converse a little bit in english cox uhm... his english also not say very good la k but we still can hold a conversation. so we have been talking since then on LINE and we sort of agree to having a long distance relationship after realizing that we have so much in common! AND I HOPE IT WILL WORK OUT LOL. ISN'T HE THE CUTEST THING ON EARTH ?!?!? HAHA OKAY LA SORRY SCROLL DOWN. Cute or not?! Got ribbon somemore lol. OK SORRY GUISE BELATED APRIL FOOLS. But anyways just to clarify I'm totally NOT attached and I didn't meet anyone at the zoo except for Mr. Polar Bear k.
And if you are curious why I call Tokyo Banana my boyfriend is because it's super sweet-tasting for me and wrapped out so nicely like a handsome dude so I just told Sinyee: "my boyfriend is tokyo banana. See he's like super duper sweet and handsome, won't break my heart/cheat on my somemore!" lol so that's how it became my boyfriend hahahaha. HAHA OKAY LA I SHALL BE SERIOUS NAO. 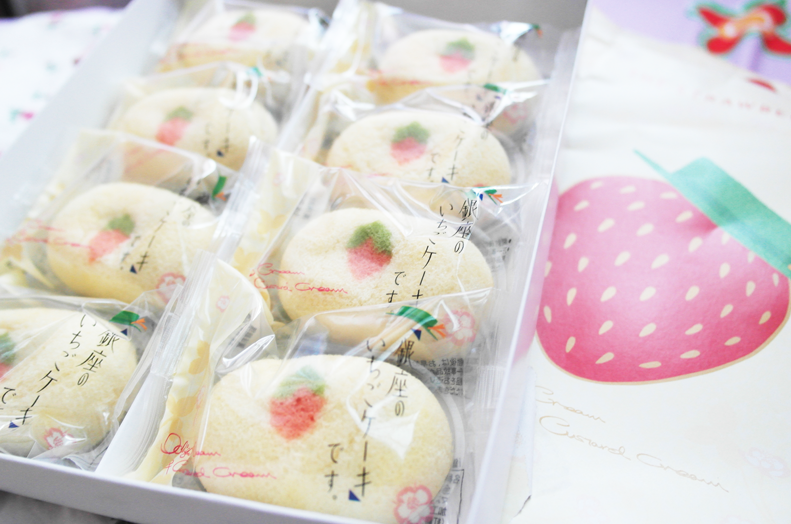 Actually this post I just want to introduce you guys some of my favorite Japanese sweets!! I prefer this compared to the original flavored one, probably because this is sweeter! But I see many people liking the original one though. 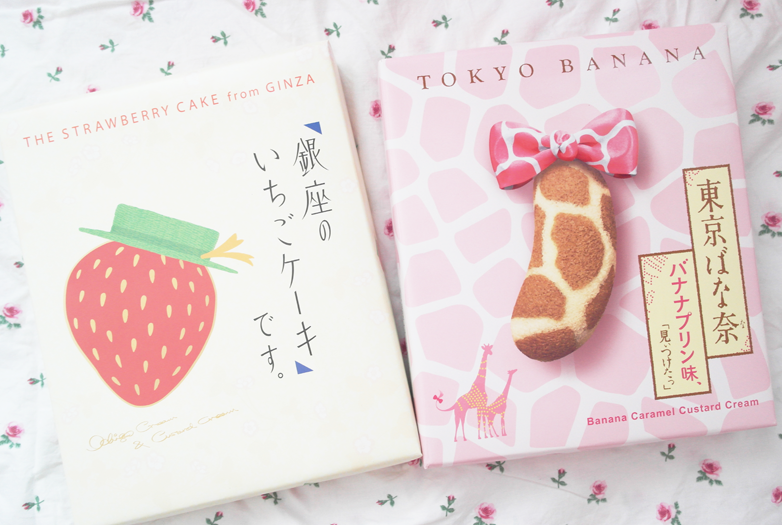 My second favorite would be the Ginza Strawberry Cake! The cake totally tasted like Tokyo banana but instead of banana cream, you get strawberry jam oozing out of the cake instead !! If you are a huge strawberry fans like me you would love this !! My boyfriend and his cousin ahem. And the next one I would introduce to you guys would be the kit kats! I'm sure you all know that Japan has the craziest amount of flavors for their kitkats but I didn't really see anything special except for this three. 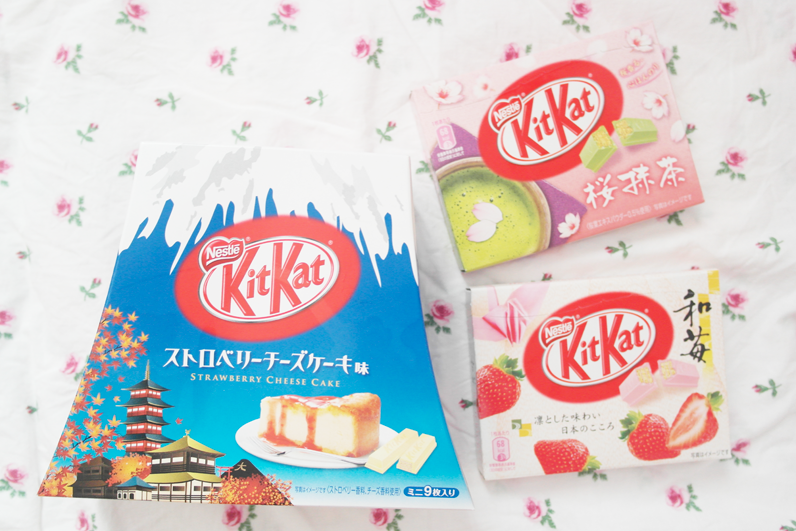 I have yet to try any of them but both my mum and sis love the strawberry cheesecake one! From the name already sounds damn yummy lor. So for the last food that I will introduce to you guys will be Shiroi Koibito! I didn't bought this though, cox I've tried it before 3 years ago already so I decided to skip it hahaha but's really yummy too! I don't know why it taste so amazing lol. 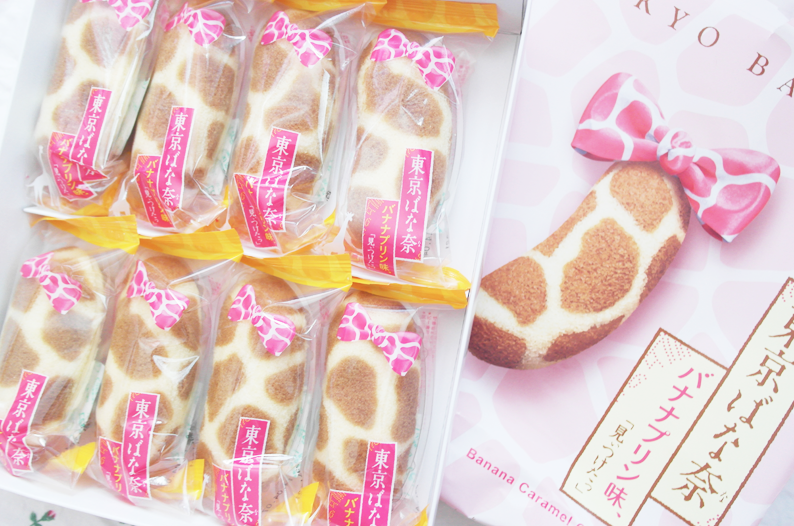 Aww my favourite Tokyo Banana!